1. What Is a Pop Up Tent? A pop up tent is a portable tent that requires little to no assembly. Instead of putting it together piece by piece, the tent is preassembled and folded. The press of a button opens it up and the tent is ready to provide shelter in minutes. 2. 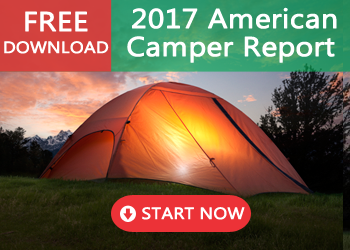 I’m a First-Time Camper. 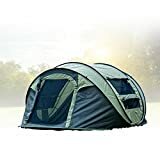 Are the Best Pop Up Tent Brands Suitable for Me? Someone with no experience assembling a tent will find the best pop up tent brands easy to assemble in only minutes. 3. Will the Best Pop Up Tent Brands Protect Me from the Elements? The fabric the best pop up tents use is as sturdy as those in mid-range standard tents that require assembly. 4. Are the Best Pop Up Tent Brands Suitable for Family Camping? The size of each tent varies, but most are suitable for multiple people. 5. 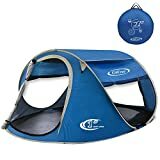 Where Can I Purchase the Best Pop Up Tent Brands? 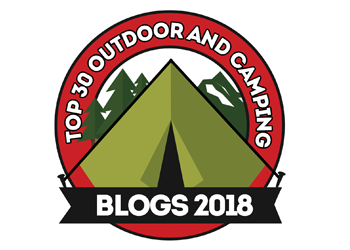 The ten pop up tent brands we review in this article can all be found on Amazon and at major sporting goods and outdoor retailers. 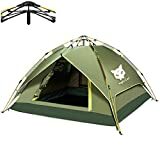 The following list of best pop up tent brands is reviewed based on the following parameters – affordability, durability, ease of setup, capacity, and style. The best pop up tent brands have a wide price range. The higher-priced models will have higher-quality materials and bigger capacity. The Quechua Waterproof Pop Up Camping Tent is an ideal choice for inexperienced campers due to its easy set-up. It features an Easy Guide system that means you can set it up and take it down in only seconds, and it folds down to a disc shape for easy storage. It has two inside pockets available for storing important small items, and its blackout interior coating makes for a relaxing night with no light sneaking in. Made from durable waterproof material, this tent is available in two sizes, holding two or three adult campers. Quechua products come with a two-year warranty. The Wnnideo Instant Family Tent is one of the most reasonable options for a large camping party. 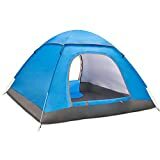 Coming in grey, blue and green, this tent fits six and boasts an easy setup and waterproof exterior. Six mesh panels allow for air exchange while keeping bugs out. Despite its large size, it only weighs nine pounds and can be broken down and set up in only minutes. The UV-resistant exterior makes for ideal protection from the sun. All Wnnideo products come with a 100% satisfaction guarantee. Coleman is one of the most trusted names in outdoor gear, and this simple two-person tent offers great value with strong quality. Lightweight and durable, you can set it up in seconds with a simple toss in the air. Breakdown takes only minutes, and the tent comes with a bag for easy storage. It fits two sleeping pads and features a removable top for additional air exchange or stargazing. Ideal for a small camping party. Coleman products come with a limited warranty for any product defects. Fivejoy is designed to be your home away from home in the wilderness. 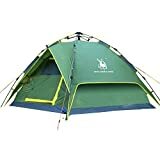 Setting up in seconds and folding up just as easily, it provides convenient storage spaces within the tent and hangers to suspend wet clothing. The windows and doors are secure and designed to stand up to severe weather including wind. Ideal for winter, waterproof polyester provides a high level of protection for your next hunting trip or wilderness expedition. The large space easily fits up to four adults. Fivejoy offers a one-year warranty on all manufacturing defects. Automatic Pop up -- just throw it and it pops up. Pitching a tent will no longer be a hassle. Spacious Room -- Popup Size:95" x 71" x 39", fit 2-4 person in it with good head room. One of the least expensive options on the list, this pop-up tent makes for an ideal choice for casual campers. 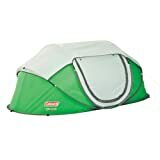 Its taped seams and water-resistant fabric keep water out of the tent, while two large windows and dual doors ensure good air flow and ventilation. 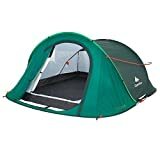 The windows have a fine mesh that keeps out even the smallest bugs, and the tent sets up and folds down in seconds. G4Free offers a lifetime warranty for manufacturing defects. The BATTOP brand offers a large size for a fraction of the price of other family-sized tents. It holds a family of four and has two entrances for easy access. Lightweight and designed for ideal ventilation, it comes equipped with a small pavilion for comfort and easy dining inside your shelter. Waterproof with quick-dry material and UV protection, it is ideal for both summer and winter. Mesh walls ensure proper ventilation on the most humid days. BATTOP offers a one-year warranty for their products. A two-person mobile shelter that collapses easily for carrying in a storage bag, you set it up in seconds. Coming with room for two sleeping pads, it has three ventilation holes for a comfortable night’s sleep. There’s room near the entrance for a mosquito net to ensure bugs stay out. This is a low-cost portable option ideal for a small camping party. TheNORTHblu offers a full factory warranty. 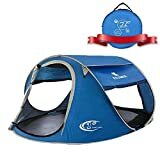 Awesome as a camping tent or a beach tent. Specifically to use at the beach. The Zomake pop-up tent sets up in less than a minute and comes with everything you need – no need to buy stakes or tarp. Weighing around eight pounds, you can easily carry it along on a hike. The 9,000-square-foot size makes it ideal for a large family on a camping trip. Top-quality polyester protects you from bugs with a fine mesh, and an included rain fly keeps you protected from the elements. It’s one of the roomiest and most convenient tents on the market. Zomake offers a one-year replacement warranty and a 100% satisfaction guarantee. This dome-shaped tent fits up to four people and comes in six colors and designs. Coming with its own carrying bag, it can be set up with a simple toss in only seconds. Two doors at the left and right of the tent are covered with nylon flaps to ensure both ventilation and privacy. The walls are made from water-resistant polyester and the window flap turns into a rain fly with the addition of a guy line. Offers a one-year warranty for non-manmade damages. If a waterproof tent is your biggest concern, the Night Cat Camping Tent is one of your best bets. It comes with a rain fly attached to six sturdy fiberglass poles. The tent is designed to resist strong wind and rain thanks to waterproof fabric that keeps you dry in even the worst weather. The floor is made from 210D Oxford fabric to keep the floor dry. It has an automatic pop-up system that ensures anyone can set it up in seconds. Two doors with high-quality zippers keep the tent well-ventilated and secure. Comes with a one-year limited warranty. Which of these best pop up tent brands is right for you? That will depend heavily on your needs. 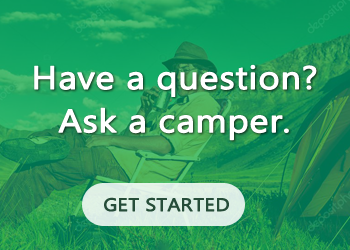 Are you camping alone? With a small party? With a large family? Are you most concerned about a waterproof tent, or do you need protection from harsh weather conditions? Is storage important to you? There’s only one tent on the list that provides all-purpose quality, easy setup, and a large capacity ideal for large parties. We give our endorsement to the BATTOP 3-4 Person Water Resistant Camping Tent as the best pop-up tent on the market today.